It takes work to send video from space. "Live from Space," a National Geographic Channel TV show airing Friday (March 14), will feature live video of International Space Station astronauts Rick Mastracchio and Japanese astronaut Koichi Wakata speaking about their lives on orbit. But how does that video get beamed down to Earth? 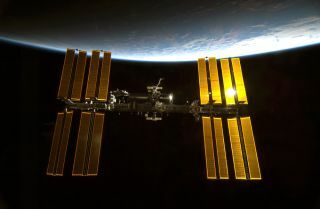 NASA mainly uses the Tracking and Data Relay Satellite (TDRS) network to communicate with the crew on the space station, NASA spokesman Josh Byerly said. The newest TDRS satellite launched to space in January. The TDRS-L satellite is one of nine currently operational TDRS satellites that enable a nearly continuous stream of information to beam back to Earth from spacecraft in orbit. The orbiting outpost loses signal every 20 to 30 minutes due to satellite locations and line of sight. These dropouts will be quite a challenge for the "Live from Space" program. Producers with the two-hour show will have to contend with some major difficulties inherent in communicating with the space station. "One of our studios is orbiting the earth at 4.79 miles per second, and two of our cast are 250 miles above us," said Al Berman, executive producer for Live from Space. "Every bit of our technical apparatus, from the mobile satellite truck to the two-way radios, has to be integrated into the NASA system and deemed secure. NASA has a huge infrastructure for sending up and pulling down signals from the International Space Station." Once the broadcast gets closer, engineers will potentially be able to predict when the blackouts will occur, but it's not exact. "As we get closer to air, those blackout periods become more clear," Berman told Space.com via email. "But, we have to build our broadcasts with the expectation of losing signal with some regularity." Sending photos down from the station is easier today thanks to upgrades installed in the system, Byerly said. Astronauts share their experiences in space with photos on Twitter and other social media sites. They can also send recorded videos of live in space down to Earth. Generally, the astronauts have more audio coverage than video coverage because audio doesn't take up as much bandwidth. Interested members of the public can listen in to live audio sent down from the station thanks to a NASA live stream here. "Live from Space" airs March 14 on National Geographic Channel at 8 p.m. ET/5 p.m. PT (0000 March 15 GMT).